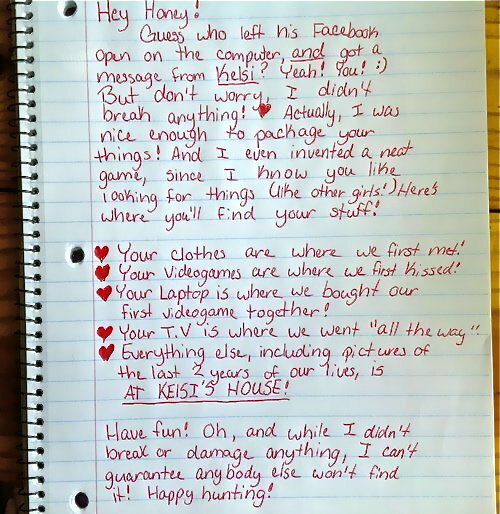 This particular letter is from a woman who writes to her boyfriend and tells him how to find his personal belongings after finding a message from another girl, on his Facebook page. Personally, I’ve sent letters to my exes that would make mothers wonder if they were raising their sons right, but never anything like this. When my ex (in 2008), stole my heart and beat the living crap out of it…I did sell his stuff on Craigslist. And, I did drop off a letter to his mother. She was the best way I could reach him, I promise. Tell me, what’s the worst break-up letter you’ve received OR, the best break-up letter you’ve sent?